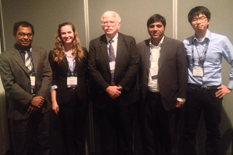 Aerospace Engineering graduate student Vera Klimchenko (M.S., '15) won first place in the Young Engineer Paper (YEP) Contest at the American Society of Mechanical Engineers (ASME) 2014 International Mechanical Engineering Congress and Exposition held in Montreal, Canada November 14-20. Klimchenko, advised by Assistant Professor Anya Jones, presented her work on "Wake Alleviating Devices for Offshore Wind Turbines." Wake behind offshore wind turbines can persist for several turbine diameters, which means that decreasing the distance between turbines increases wake-turbine interactions and decreases the efficiency of downstream turbines. Klimchenko's work looked at evaluating three types of blade-mounted structures that could help to speed up the dissipation of wake from an offshore horizontal axis wind turbine. According to her abstract, "implementing blade mounted devices on the blades of a wind turbine can induce mixing into the tip vortex core, which causes the breakup of the tip vortices and quicker wake dissipation." Determining which structures are most effective at dissipating wake could help improve efficiency and optimize off shore wind farm energy harvest. The ASME Fluids Engineering Division (FED) sponsored this year's ASME YEP Paper Contest. First place winners receive a cash prize, complimentary conference registration and additional funds to offset travel expenses.